My plans for yesterdays were simple—a quick trip to the grocery store to pick up some yogurt, and a few other things (like some frozen vegetable) , and then on the way home, a stop a the green grocer, to stock up on salad and soup greens. Once home , put the groceries away, cooking some (a quick vegetable soup), and in the evening, some knitting. Mission accomplish—Except for the part about getting home after the shopping. My car died. Something shorted or failed between the ignition key and starter motor. Turning the key got me the radio and other electrical stuff (battery is new, and fine) and a clicking noise (some sort of switch or solenoid) but no crank of the starter. So yesterday's quick trip to the market took all day (what with waiting for the tow, getting to my garage (by that time the tow truck came, rush hour –which really is rush HOURS—had already started) and getting home again. The weather was mild—but it was raining all day, and the roads were slick—heavy traffic was made slower by a few minor accidents along the way. All in all, it was nothing physical really –well actually getting into the tow truck (a million feet up) up was. The truck didn't have a handy step up, and there wasn't even the 6 inches the curb would normally provide—so was a bit of struggle--(and solved inelegantly by climbing up on my knees!) but the stress of the whole thing left me exhausted. I got the groceries put away, but no soup got cooked (I ate canned soup and big salad for dinner) and no knitting got done. I had planned –in the back of my mind—a trip to the garage planned some time SOON. One of my signal light just failed this week (the FRONT drivers side—but the side (front) and side(rear) and rear all worked, and I needed an oil change, so getting to the garage was a must do, but not a must do NOW. But not being able to start--(and being parked in a space that was legal for the moment—but not for long term (alternate side of the street parking regulations would have kicked in at 8 AM today) was a do NOW situation. 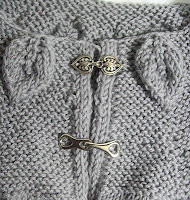 So the only thing that got done on the Leafy Sweater/Vest was I unearthed a few sets of hooks and eyes. I found one set of 7— and another set of 5. I like the set of 5 (a sort of leaf motif) better—both for the style, and the size--and I'll look and see if the style is still available--(and just buy 2 more). But if I don't have success, I'll use the simple ones. I as counted, I remembered my cherry red acrylic vest-- on which I had used the leaf motif hooks—had a V neck –and needed few hooks and eyes than this slightly lowered neck vest will. 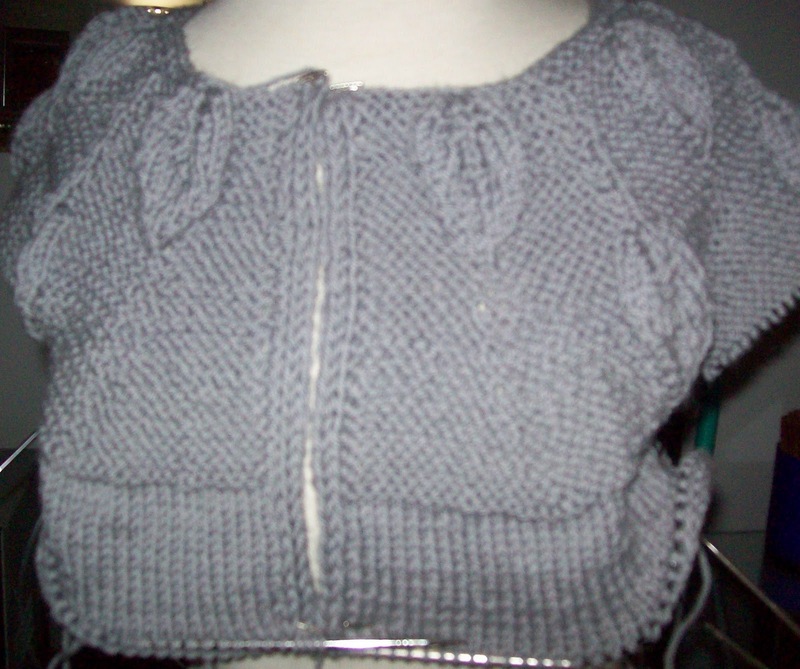 But just... Only a single row has been knit with the next skein. Another 2 inches added to the body—and that's about it. I just got busy yesterday –(It was a beautiful day and I got to walking) and knitting just wasn't my number 1 priority. Still—I've made some progress in the week I have been knitting—and it is just a week since I started this sweater vest-- And while progress has slowed, I am still making progress. 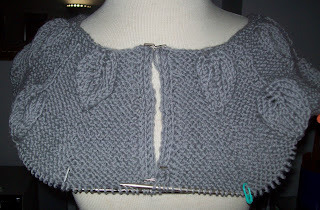 I am now I am close enough to finishing the body of the sweater vest, that I want to finish it—so I can try it on--with out worrying about dropping a stitch—and to really see how it fits-- and to start on the collar –the next big piece to knit. Since my plan was always for a vest— if I do add sleeves, they won't be full length ones—Even if it ends up that I have enough yarn. So it won't be long till it is finished! But—I know me—My tension starts to slip when I get tired—and while I don't Row out- for a whole row—I do find loose bunches of stitches here and there. So last night when I was tired, what I did, instead of knitting, was to weave in a bunch of ends. So now every loose end (except the provisional cast on ends) has been woven in. I love getting the ends woven in as I go! Latter today, I will go look for the hook and eye closures—I have a couple of different ones—but I don't remember how many sets of any one design. Like many who collect buttons, I also collect and re-use fancy hooks and eyes. 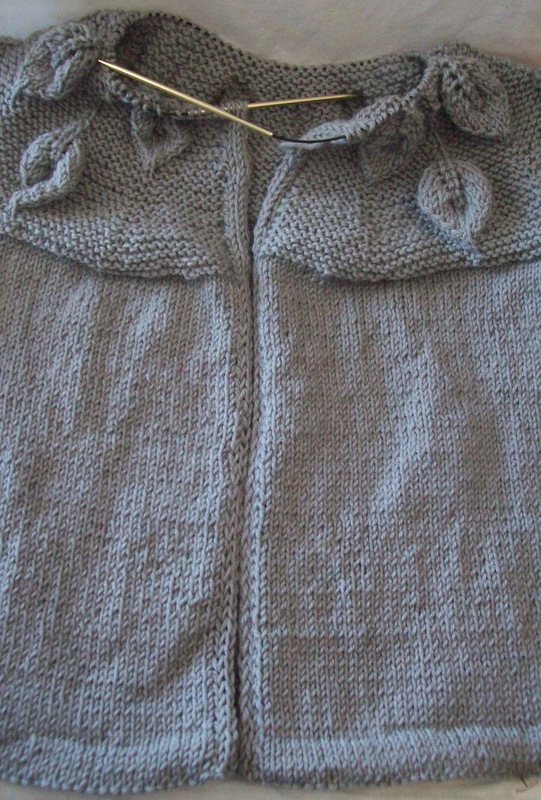 I think I want a full closure –not just a few at the top of the sweater vest—but all the way down the front. AND I think I have at least one set of 6—recycled from a bright cherry pink sweater vest –an acrylic one—that suffered a mishap in the dryer. If I don't—I might need to go shopping—Not today... but soon! 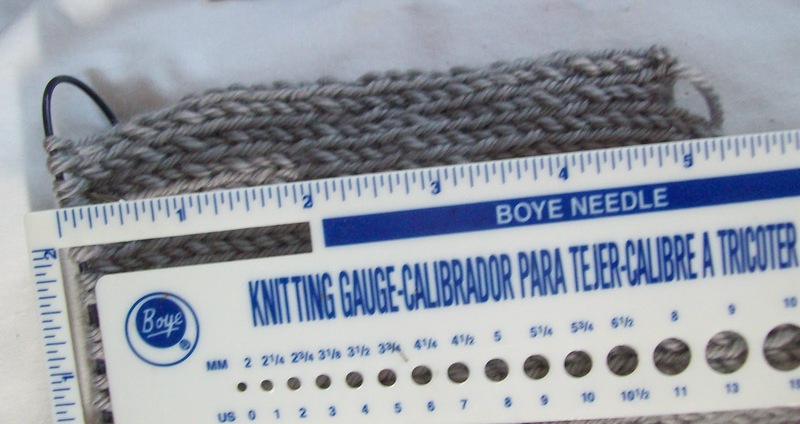 158 yards--or almost 5 inches of knitting. 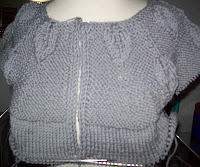 I started yesterday a few rows into the 3rd skein of wool, I ended last night half a row into the new skein. Measured from the cast on stitches at the under arm, I am 1 row short of having 5 inches. I actually started the skein a little bit before that row, but not so much more that it counts for much. If I were to try and model it on Missy the dress form—well, her neck to back length is a just 13 inches—and it would look done. But my neck to back length is 18! (I am very long waisted!) --Still 14 inches (using 3 skeins) is good progress—and it certainly means I'll have enough yarn—Plus it's far enough along that I won't find my energy or enthusiasm for knitting it fading—1 more skein (the one in play now) will add another 5 inches--(18 inches!) With another half skein, the vest will be nice comfortable top of the hip length. Even if my pace slows (and it will) that just 2 days worth of knitting. After the body and collar, I will still have 2 more skeins of yarn! More than enough to add sleeves-maybe not long sleeves—but then I don't much like long sleeves anyway! It's mild today, --and the forecast is for continued mild weather—but February is usually the coldest month in NYC winters—and at this rate, when the next cold snap arrives (next month is just next week! 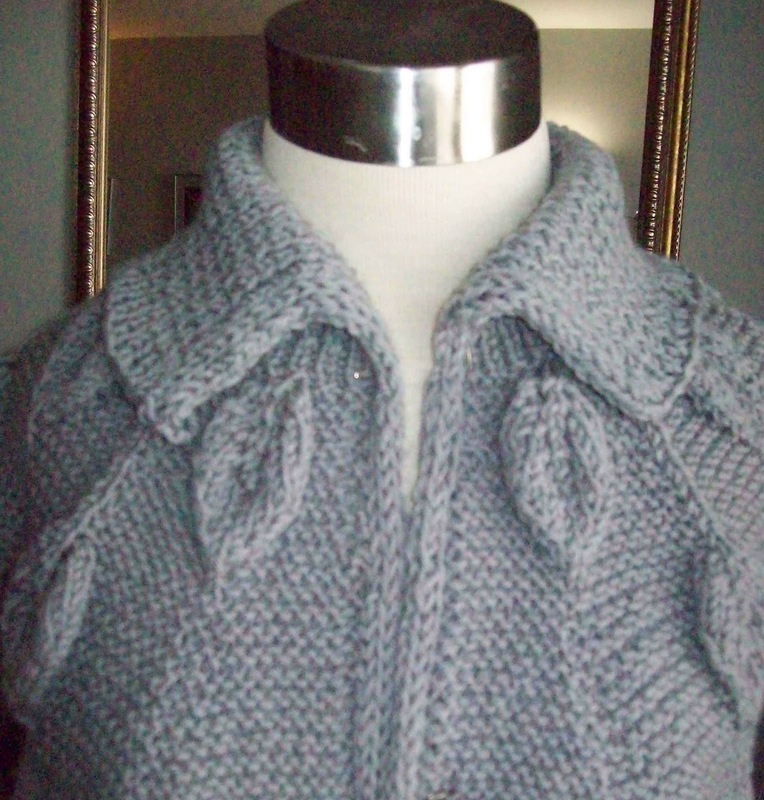 ), I'll have another warm sweater/sweater vest to wrap myself in to keep warm! 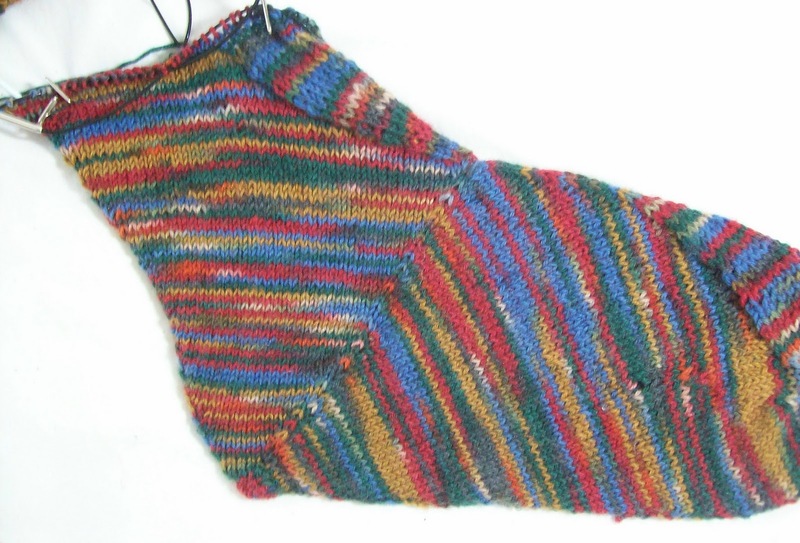 Given that I added 4.5 inches in length to my vest—it's should be very clear that no progress at all has been made on the socks! I have it! 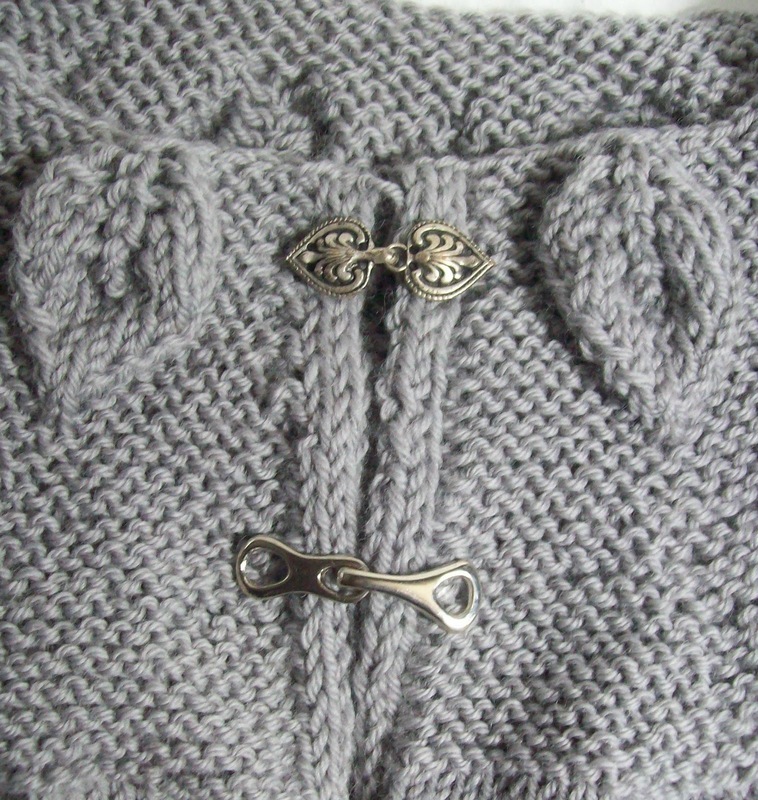 No sooner did I write that I needed warm woolly vest and sweaters, than I was struck. It might not look like it—since I didn't use contrasting yarn, but it has a provisional cast on--before I knit any sleeves, I want a nice deep collar. I have 7 skeins of this wool—and I think that is more than enough—but I get anxious-- better to start with a provisional cast on, knit the body, and then the collar, and then add what ever is left to the sleeves. It's a top down (D'OH!) simple thing—not a raglan—but almost the same math—I am doing 16 increases every 4th round, (vs 8 every other round) and then just adding the raised leaves for interest. 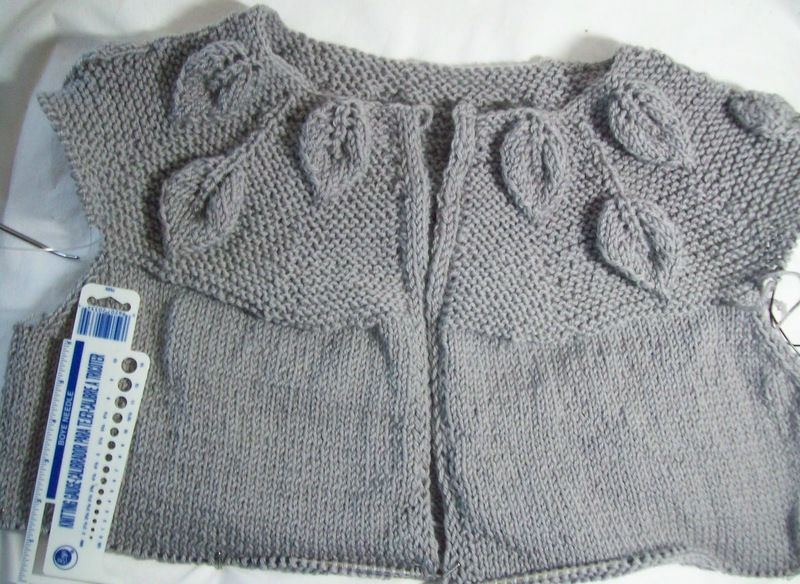 1—they leaves are stocking knit (not garter like the background) and are longer than the back ground knitting. 2—the leaves have a bunch of increase in the beginning (the lacy YO) that put extra stitches into the work. 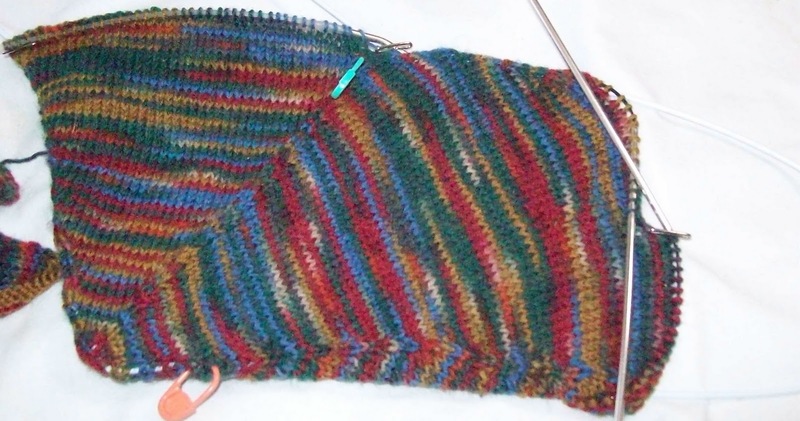 The second half of the leaf, with the decreases, actually changes (decreases) the over all stitch count for a row or two. But by then, by the last row of the leaf, the other increases have made the over all yoke bigger—so no matter—there are always more stitches per row! Should I feel like I am running out of yarn—I can always add some stripes or a change of color for the lower edge —grey is a nice neutral—almost any color will go with it. 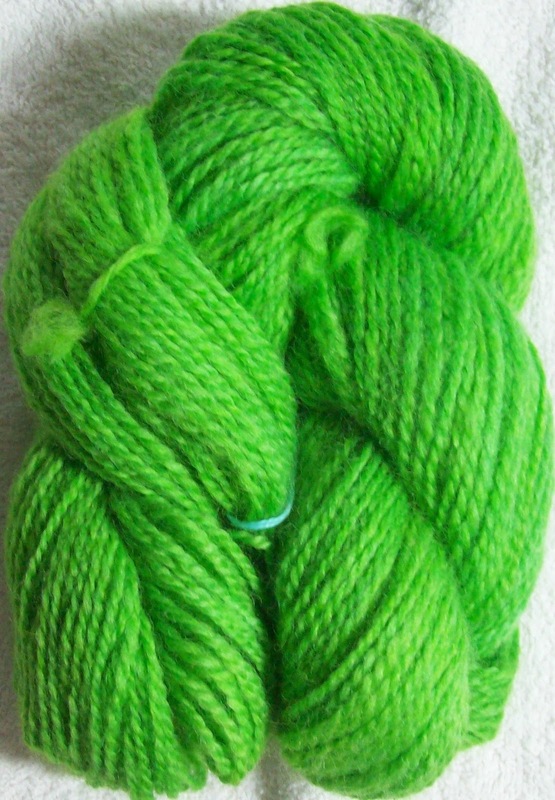 And I have a number of colors of this wool (including several white skeins that could become any color I want!) Since the collar is yet to come, stripes—or even a single contrasting color could be added at the hem, and again at the collar-to make it look like I planned it that way—which, in a way, I have! I could go with yellow (I don't think so)--I do have some grey and yellow socks, and some green and yellow clothing. I could go with a deep cherry pink (I like the idea better, but I don't really have any deep cherry pink clothing) –though I do have grey and pink socks. I could go with a blue—I have lots of blue clothing—but—Boring! Still blue might be the most functional color to add. I even have a nice dark green-- Well I don't have decide now! Tomorrow is a busy day (I will be out most of the day) but I might have down time—I could end up posting—or I could end up being too busy. I am bringing my antique lap top with me, and my camera-and I'll see how things develop. For sure I have time for knitting--so by the next post there should be more of the vest--and maybe even more of the Black & Whites socks. Like a proper cold, it's all gone. No more sneezing, headaches, muscle aches or fever. Slept through the night with no medication. And, as I began to feel better on Saturday—I started my January socks—Black & White cookies. I still haven't finished the secret socks (they are sans toes) but I can work on both at once. Here in NYC Black & White cookiesare, well , The bakery treat. They are large (6 to 7 inches across) cake-like cookies, with very dark chocolate and vanilla fondant frosting. One recipe I have for making them calls for a box of vanilla (yellow) cake mix—made by reducing the water by half (if the mix calls for 1.1/3 cups of water, add 2/3 of cup, instead) and all the other called for ingredients. The stiff dough is baked by they half cupful, on greased sheet, cooled and the flat side frosted. But I have never found a recipe for the frosting that is like the bakery ones. I am not, (never have been) a big fan of Black & White cookies. But that hasn't stopped me from eating many of them over the years! 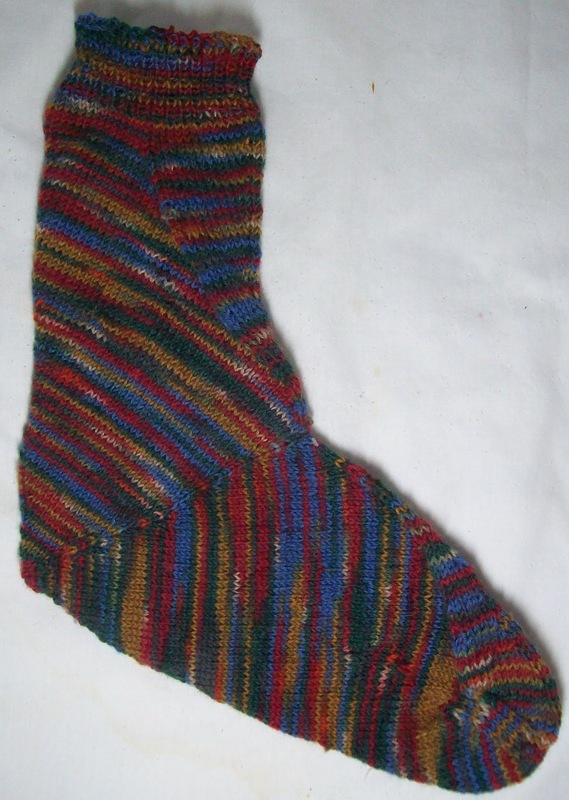 So, the socks—Black and White—and because they are intarsia –the simplest possible intarisa—(straight line!) I am knitting them flat to begin with—it's just easier that way. And because they are socks, not cookies, I am taking the liberty of making a fancy zig-zag seam—a simple set of twisted stitches—rather than the perfectly straight line of the cookies. They are hard to photograph—the Boyle needle just doesn't want to be pulled straight. They are mirror image, too, which make it a bit easier to knit. I started with a long tail cast on—and 2 extra stitches (for the seam) and worked a few rows of stocking knit and reverse stocking knit for cuff. And now I am knitting away (gleefully twisting the yarns and stopping to undo them (twice already) every so often. 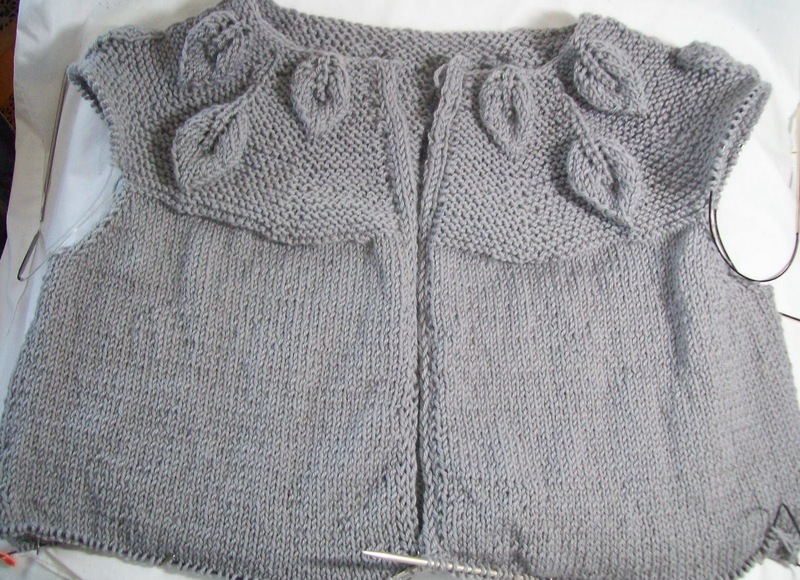 The intarsia will be center front, the seam, center back. 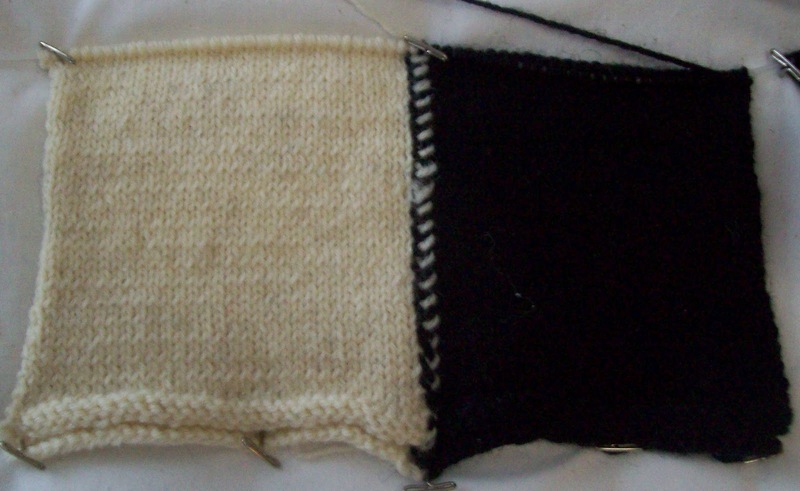 The black and white motif will continue to the heel and then the foot will be a solid black. There will be lots of left over white yarn--(I am working with 2 50g skeins)When done, the remaining white will likely be dyed and re-purposed. I have 1 full and several partial balls of the black—enough. (Too much!) I really dislike working with the black yarn—Kroy make a very deep, dark black—In French they call it carbon –and coal black it is! Working flat, I have to take care with the purl rows—If I let myself get careless, I can row out. Not a problem yet—but I know myself and my knitting. 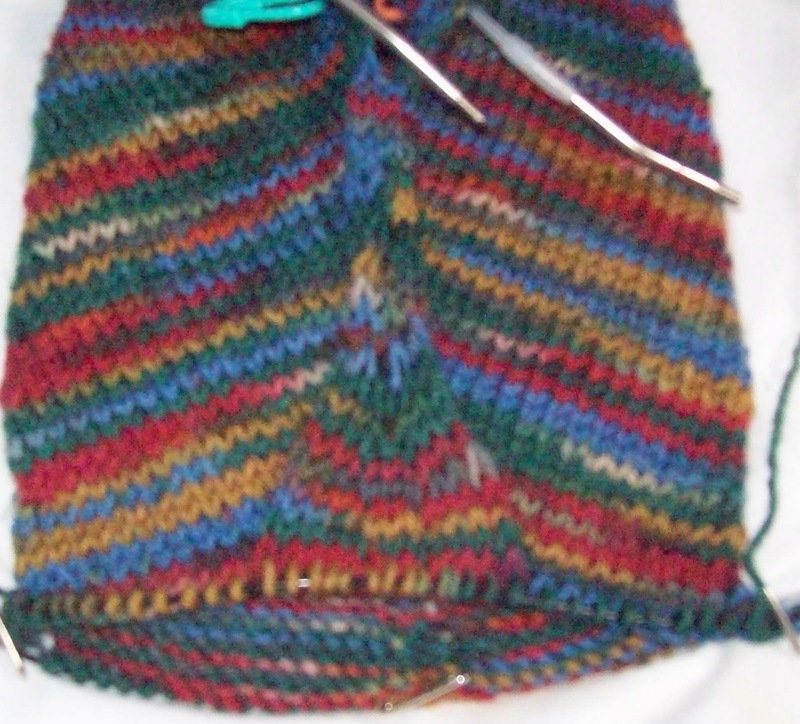 It's been a long time since I've knit a sock with a flat knit top—the change up to construction is fun. Well then fill the dye pot! Which is exactly what I did. The result is a nice semi solid green for the Black Eyed Suzy socks. 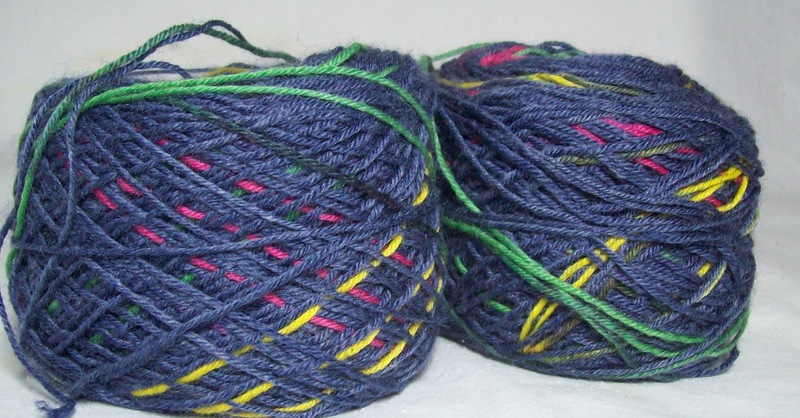 This skein will be balled up today-- and maybe while I am sitting there, a few other skeins will find them selves on the swift and be balled up too. That's not knitting either, but it is still fiber related. I have absolutely no plans to start the Black Eyed Suzy socks now—I think my next pair of socks are going to be something simple and straight forward—maybe a simple self striping yarn—that will be an easy and fun to do sock. A perfectly boring sock--December socks were different enough to make boring socks something to look forward to. 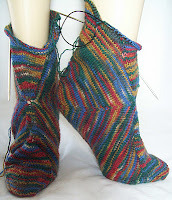 But I have been planning the Black Eyed Suzy socks... A multicolor ruffled edge, plain ribbing, then several bands of floral patters, The heel will be turned, with the gussets on the sole of the foot, and the sole instep will be a leaf pattern--the sole itself, a simple seeding pattern. I've found patterns, and have been graphing them on graph paper index cards—so when the time comes, everything is all ready to go! And my empty sock bag? It's been filled—a blue/teal self striping yarn, and coordinating green for the Dragon fractal—My first thoughts had been black socks with red designs—but..black is so horrid to knit with—and then when I read there are further refinements of the Asian zodiac, and there are years of Water dragons, (vs earth or air) I was set. Blue is much more practical color, and so much easier to knit with. I finished up Decembers socks—all the ends (not many but a few) have been woven in, and then promptly caught a cold. It's just a head cold, not serious. I feel tired more than sick—I am stuffy, and congested, and persist in thinking its nothing—and go about my normal day—and then Zonk—as soon as I sit down, I am out cold for few hours! I don't really feel that sick—but I have no stamina and no energy. I feel a bit better today –because I took the night time cold remedy that promises a good nights sleep—It's a take one dose every 6 hours, but once asleep, I sleep through for a good 8 hours. Now up and about, I for a few hours, I am ready for a nap! I am stuffed up, but don't really feel that sick, just tired. I try to avoid medications—so I won't bother with day time relief capsules—and will muddle through napping and drinking fluids, and being a bit lazy till I feel better. I am thinking about socks—and now that Decembers socks are done, I have another little clear plastic case to fill with a sock kit... Which one? 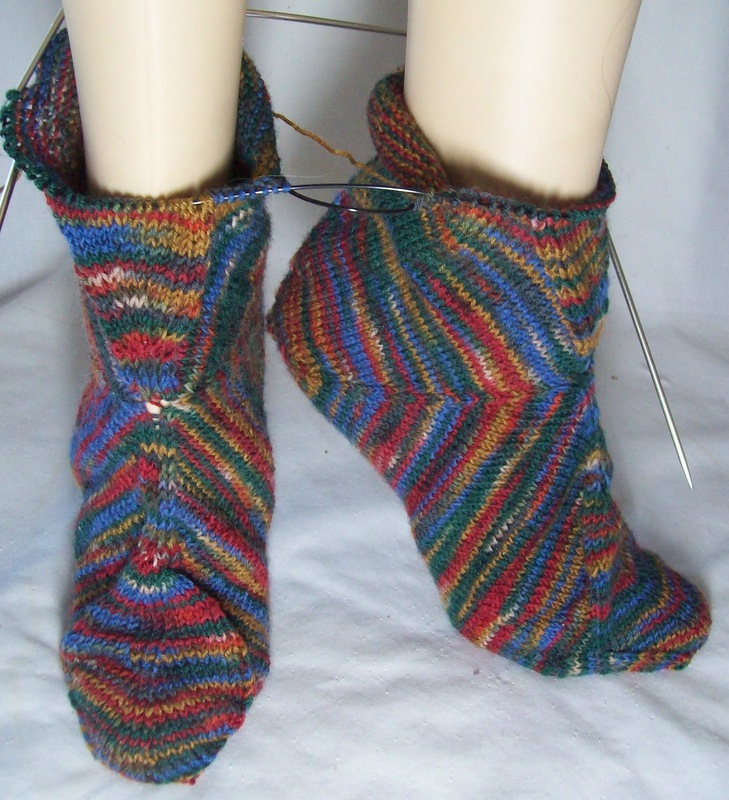 Problem is—sock ideas don't live in a vacuum—they need to be paired with sock yarns. Take the idea of another pair of puffysocks –The first time round, Red, white, and shade of grey going to black. I like the look, I like the results, and I think it would be good to do another pair. Or how about bright yellow, then white, then shade of brown? No way, I don't have shades of brown. OK then, bright yellow, then white, then marigold yellow, and then deeper yellow orange, then rusty orange, then brown. I think I could manage those colors.. but do I have a need for socks in these colors? I have a huge stash of self patterning (stripes and mock stranded color work) –and a semi huge stash or semi solids--(mostly solid with intermittent colors) and I love these yarns for basic generic socks. But I often want to knit more exciting socks—and multi color socks yarns are best suited to simpler socks--Where as complex socks are better in simpler yarns—Not necessarily solid, but not to busy a yarn—I don't like when the yarn and stitch pattern compete. 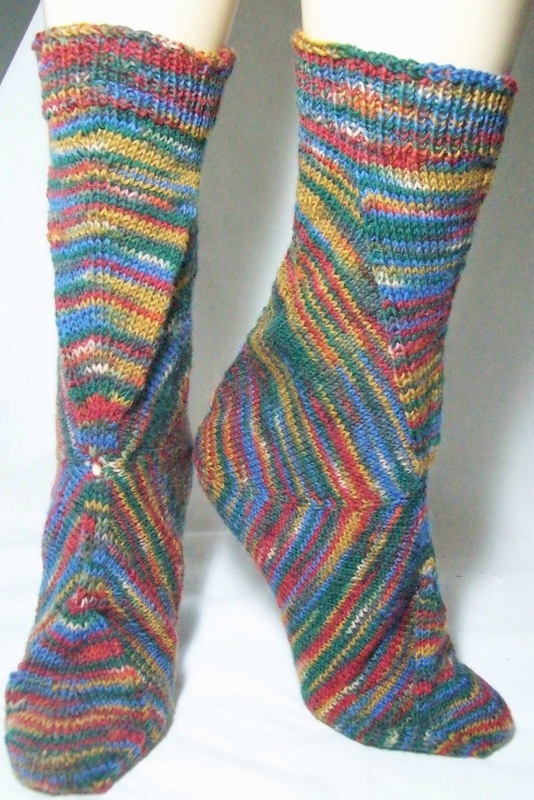 And then there are socks I want to design, knit and document for a book on socks—What yarns for these socks? What designs? When to knit them? Well, I should be feeling better in a few days...maybe I will be thinking clearer and have some idea of what to do next. Saturday is supposed to be for sewing (and I do need to get some done—I've stalled again on the scale, but things are shifting and clothes are looser than ever) but instead, a nice walk (it was spring-like out yesterday!) and some knitting. The finished socks are the strangest looking things—they don't look like any sort of normal sock but they fit fine—better than fine. The fabric hugs the underside of my foot, and the back of my ankle. There is plenty of ease at the instep—with out any part of the sock being baggy—even though they look a bit baggy on LEGS. This idea (and it's not my original idea—I know of at least 4 other patterns for socks that start at the heel) works. It has a totally different rhythm than toe up or top down socks. I learned a lot knitting this first pair. 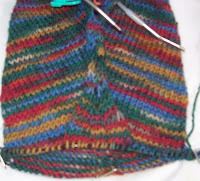 --More clearly marked quadrants—I used 2 stitches, 4 would be better—maybe even 6 for the instep (but not the center back and center sole)I think a strong line would improve the look and feel of the sock. 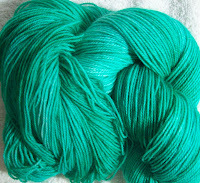 --And the yarn will be a yummy semi-solid—some wonderful color that sings! These socks look there best when displayed and lit with the Ott (type) light—and I suppose will look good on bright sunny days (outdoors) but the rest of the time, they are too drab for my taste. Today I am off to a wedding show case with my daughter—I am a very laid back mother of the bride—but she invited me—so all is good. My daughter has very strongly defined taste—but she also has an open mind—so it will be fun to see what catches her fancy—if anything! The leg is inching upward—but still has a ways to go. 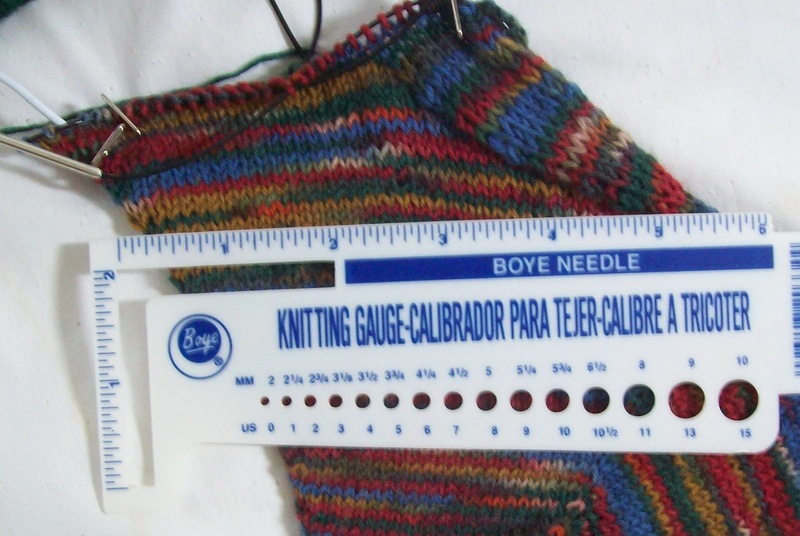 The image below and to the left shows the lop sided progress—The gauge is about parallel with the stitches before I started the leg portion of the sock—and as you see, about 1 inch of knitting has been added to the back of the leg—but almost 4 inches have been added to the center front of the sock! What is less evident (the bias stitches hide it to some degree—is the stitch count went from 164 to 64—100 stitches decreased--in the same 4 inches. 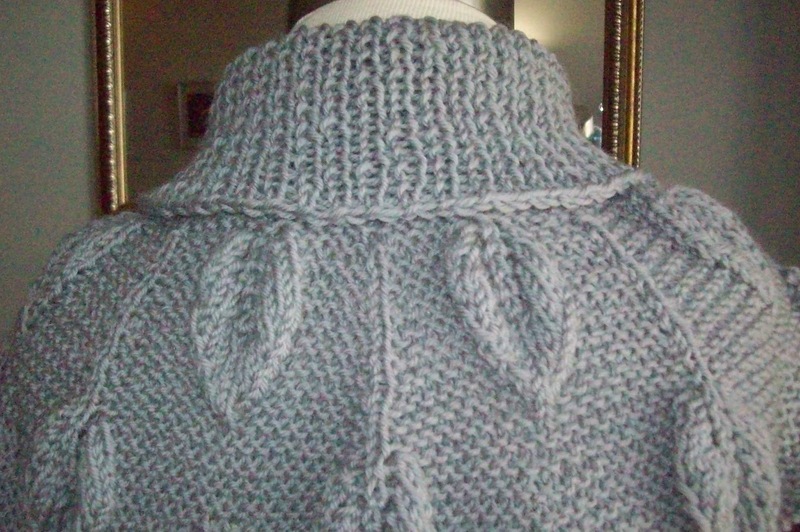 That is the work of a whole bunch of short rows! I wish I could say I was out of sock yarn (or running out soon) and would just have to live with socks that were taller in back than in front—but I have lots of yarn left—and lots of knitting to do too. I like the fit—I like how the bias fabric hugs my arch and the back of my heel, (yes, I know its loose and baggy looking on LEGS—but my feet and legs are bigger) and I even sort of like the V wedge in front—and I like how there is no pooling of colors--not anywhere! A pretty interesting thing—especial since the number of stitches in the wedge, or round are changing all the time. Now they are almost finished—and that what I want most—to be done. Maybe tonight—I know I am going to try! That's what its all about, isn't it? Every knitter (or crocheter, or weaver, or fiber artist) is all about the fiber—We love to hold and cuddle it, we love to work with it, we love to wear it. We might (I think we do!) have a higher need than the average person for certain tactile sensations. We were the picky kids, who had favorite clothes that had the right tactile sensations--(and sometime scratchy was what we wanted—and love certain clothes or blankets because they were just the right amount of scratchy). And now as adults, we love certain fibers. Kimberly (aka Boss, even though she hasn't been for the better part of the year) is especially drawn to yarns for the tactile sensations. For her, smooth and silky is a must. (Me, I don't mind—even right next to my skin--some wools other define as scratchy. For me, color is as important as touch) Her stash is top heavy with Malabrigo, and one of her favorite yarns is Sanguine Gryphon's Skinny Bugga— 80/10/10—a blend of wool, cashmere and nylon. I can't fault her taste—it is a lovely soft yarn, bouncy and smooth, soft and strong. It came to me in a natural white—but today it was transformed into a peacock blue—a near solid. 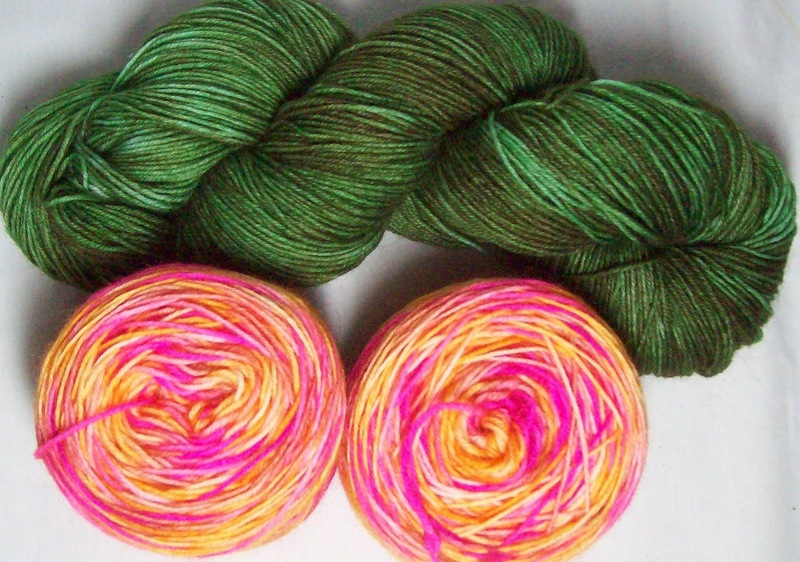 (My motto, if you can't make an effort to knit yarn, dye some!) There were a few places the dye just didn't take up evenly—but no matter—it's just beautiful and a color that is sorely lacking in my stash of shawlette/scarf yarns. While I was in a dying mood—I also dyed some skeins of hand spun. 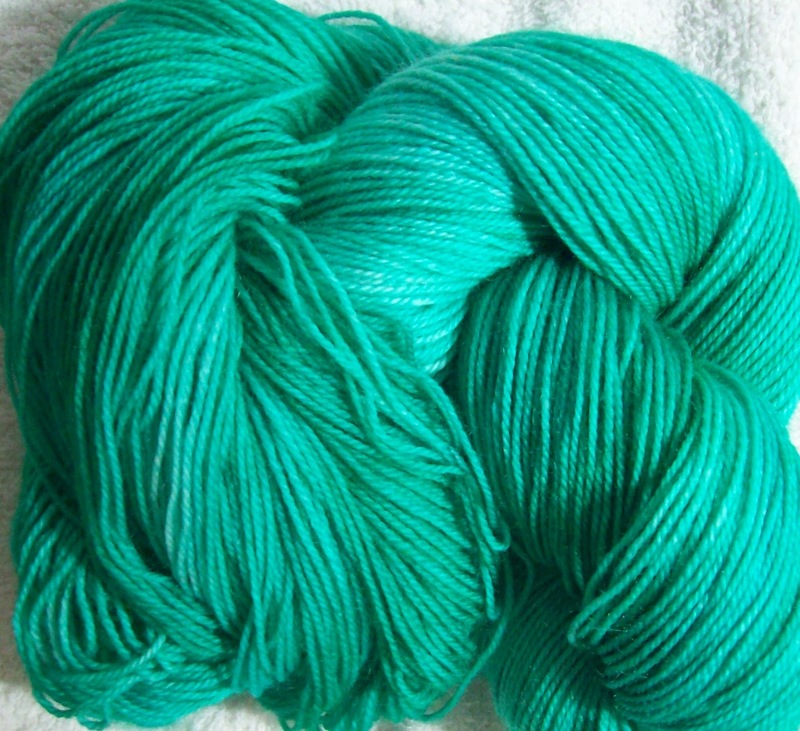 This yarn is closer to a worsted weight. I started with a dye labeled celedon (which to me is a green—a light green, a grey green--but green) that was, to my eye, much too turquoise, and way too dark. It was a lovely turquoise--but since I had just dyed a skein in peacock blue (and what is peacock blue but a shade of turquoise?) I wanted something different. I add a bit more green until I ended up with this—which also isn't celedon, but is a lovely green, (a slightly bluish green) –close to a Nile green I think—but never having seen the Nile, I could be wrong! My collection of yarns for scarves and shawls is huge--(I have them bundled in a 3 gallon zip lock bag) –with a range of colors—reds and pinks, browns and blues and now turquoise and green. There is another skein of natural white ( large 200g skein skein) of DK waiting to decide what color it wants to be—its whispering purple—and I might listen to it. But it's in a cake, and needs to be skeined before it can be dyed, so its going to have to be a bit more insistent before anything happens. But I can knit NOW. January socks—when I get to them-- are going to be dead simple: practical, generic socks. With no expectations, they won't disappoint.